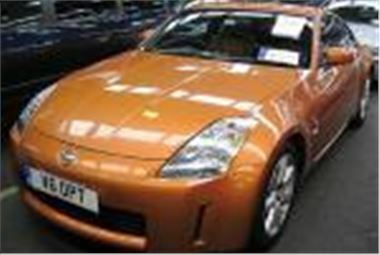 This RHD 2002 built 42k mile Jap import 350Z automatic had leather and satnav that spoke in a sweet Japanese voice, but seemed to be lost. It sold for £13,750. A 72k mile 03 reg MINI Cooper in red with a white roof but with no a/c or CD player sold for £6,325. A 128k mile 2000W Mercedes S320L went for export for £11,600. A 70k mile 2001/51 facelift BMW 320dSE 150 sold for £7,250. And a 65k mile 03 reg Mondeo LX TDCI 130 estate sold for £4,700. So there were a few bargains to be had today. Here’s a longer list. As usual, ‘s’ means sold. ‘p’ means top provisional bid. n/s means not sold. Top Car, Black Horse top cars, Porsche p/x, Fleet & Finance, Inchcape no reserve p/x, Reg Vardy p/x, Hartwells p/x, Pendragon p/x, Lex Vehicle Leasing, Franchised Dealer p/x, West London Nissan p/x. Ford Ex-Rental Sale, Fleet & Finance, Leaseplan, Lex Vehicle Leasing, Lex HBSC, Jardine p/x, Sytner p/x, Black Horse, General Section, Inchcape p/x, Snows Group p/x, Trident Honda p/x, Pentagon p/x. Light Commercials from Dagenham Motors, Royal Mail, Lloyds TSB, Lex Vehicle Leasing, Northgate, Fleet Direct. Fleet & Finance, LTSB Autolease, Leaseplan, Motability, Lex Vehicle Leasing, Citroen UK, Hitachi Capital, Peugeot Charters p/x, Private Direct, Inchcape p/x. As always the best way to look for a specific car coming up at a BCA auction or to pre-check a day’s sale is to visit www.auctionview.co.uk If you are a BCA account holder this service also now gives composite price information (average auction price, CAP and Glass’s) and now allows you to buy a selection of cars directly on-line. For BCA online auctions go to www.bca-online-auctions.co.uk. Two types of sale: Live Online and Open Tender. These are only available to BCA MyBCA Loyalty Card holders. For future police sales at West Oxfordshire Motor Auctions. Visit www.woma.co.uk, click on ‘stocklist’, then click on search, or use the faxback on 0906 3080 953 at 60p per minute. Sales are held on Tuesday and Thursday evenings from 5.30pm.